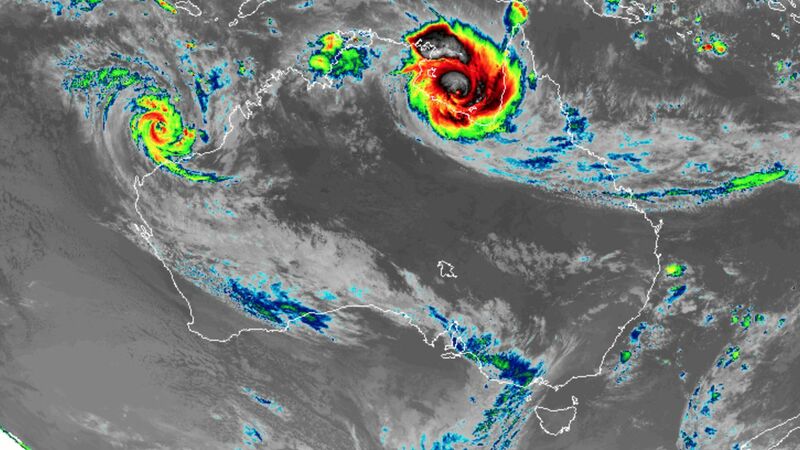 Two ferocious cyclones are taking aim at Australia this weekend, with the possibility that both could make landfall as Category 4 or greater storms within 24 hours of each other. If that happens, it would mark only the second time in the country's history that such a weather event has occurred. Why it matters: Cyclone Trevor, in the Gulf of Carpenteria, and Cyclone Veronica, off Western Australia, are each intensifying while moving slowly toward land. These storms threaten to bring storm surge flooding to the coast, damaging winds and excessive inland rainfall. Of the two, Cyclone Veronica appears poised to hit a more populated part of the country, potentially coming ashore on March 24 near Port Hedland in Western Australia. That city of about 16,000 could be inundated by a powerful storm surge as the storm barrels slowly inland.